Facilities boost: Campbelltown MP Greg Warren with Campbelltown Public School Principal Anna Butler and students celebrating their newly upgraded playground. Upgrades to the playground at Campbelltown Public School have recently been completed thanks to a grant under the Community Building Partnership program. 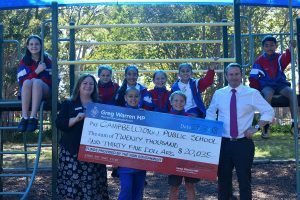 The $20,035 grant was supported by Campbelltown MP Greg Warren and was used to install seating, shade shelters and relay playing surfaces in the 140-year-old public school. Mr Warren recently visited Campbelltown Public to inspect the new playground upgrades, and was joined by principal Anna Butler and some of the students who are enjoying their new playground. “I am extremely proud to support Campbelltown Public School with this grant,’’ Mr Warren said. “They recently celebrated their 140th birthday and it’s great to be re-investing in the school so they can continue to provide a great education for many years to come. “I want to thank the members of the school’s P&C and the school staff who have worked so hard for so long to achieve this grant – this is their victory. “I encourage other school P&Cs around Campbelltown to look at applying for grants in the next round of the Community Building Partnership later this year,’’ he said. $50,000 to Beverley Park School for an all-abilities sensory playground in conjunction with Campbelltown City Council.